I have already added Konan [Angel of God] once it was added to the server. You can read more about Konan on that post. We will directly move to the abilities of normal Konan. 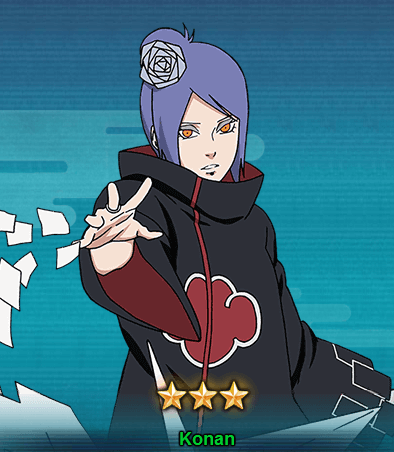 Let’s take a look at Konan abilities. Ninjutsu Shikigami Dance – Punishment [Prompt]: Causes Heavy Ninjutsu damage to up to 9 units under Tag from the opponent’s formations, the selected unit will also suffer from Knockdown. Taijutsu Paper Blizzard: Attacks the opponent’s units in the front row and causes Tag, this attack might also cause 3 COMBO and Knockdown. Taijutsu Paper Clone: High chance of evading the first Standard Attack received each round. Ninjutsu Angel of God: At the beginning of a battle, generates a Shield of up to 9 Akatsuki units from your field based on 40% of each unit’s Resistance base attribute. Their Ninjutsu and Attack attributes will also be increased by 30%, lasts for 3 rounds. Taijutsu Angelic Advent: Chases and Attacks a Knocked Down unit, causes Knockdown and 10 COMBO, a selected target will suffer from Tag.